Last week Senator Elizabeth Warren (D-MA) finally got her scalp. Tim Sloan, CEO of Wells Fargo & Co (WFC) resigned, part of the blood letting demanded by progressive politicians in recompense for the bank’s numerous acts of fraud, stupidity and malfeasance. WFC shareholders are paying for these sins and omissions in a number of different ways. As usual, the officers and directors are largely unscathed. "Impacted consumers" are not really being made whole in any meaningful fashion. But the lawyers, politicos and regulators thrive. Once the stellar performer among the nation's four largest banks, WFC is now sidelined in terms of growth and overall performance under regulatory sanctions. These facts and the attendant media noise relegate the bank to a subordinate number three position beneath JPMorganChase (JPM) and U.S. Bancorp (USB) in terms of book value multiple of the equity shares. 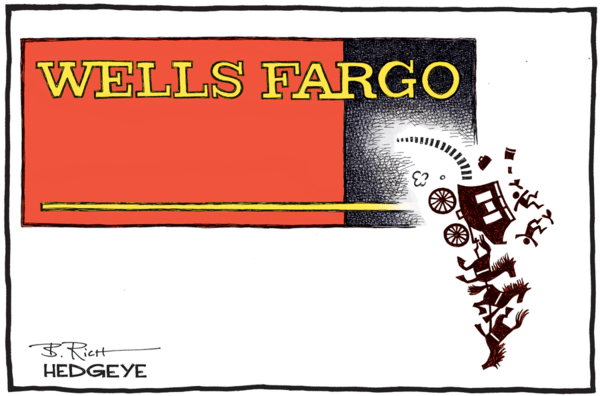 So here’s the question: Is there a bull case for Wells Fargo & Co? The bank’s performance is actually still quite strong despite its self-inflicted legal and reputational wounds. Indeed, we’d contend that most of the market's discount from the near 2x LT book value once enjoyed by WFC is due to operational errors and the resulting negative media coverage, regulatory actions and political noise. The bank’s financial performance has clearly slowed and capital is down, but WFC is still a peer performer compared to its largest competitors. Can WFC regain its past glory and specifically trade closer to 2x book? Maybe. Brand destruction is tough to reverse. A lot depends on who ends up running this now $1.9 trillion asset behemoth and how long the Fed and OCC keep the bank in the supervisory penalty box. But at the end of the day, as with George Gleason at Bank OZK (OZK), WFC will regain the confidence of investors and thereby regain a premium valuation by delivering earnings and otherwise being vewy, vewy quiet, to recall the advice of duck hunter Elmer Fudd. On Friday, WFC closed at 1.3x book, hardly cheap for a commercial bank and below the comparable multiple for JPM and valuation leader USB. Bank America (BAC) and Citigroup (C) trade at a book value discount to WFC of 1.2x and 0.8x, respectively. But looking at the performance reports for year-end 2018 prepared by the FFIEC, WFC has diminished in terms of size and other key performance metrics. 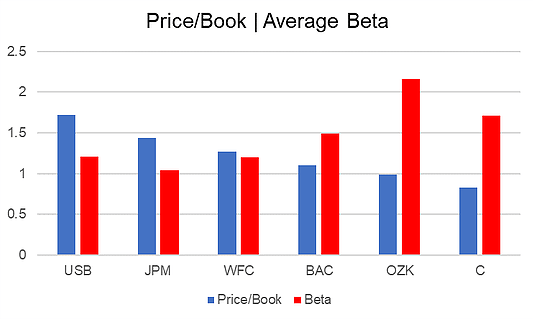 Even with that said, WFC remains a reasonable peer of the other four largest money center banks as measured by price to book value and average market volatility (beta). In terms of net income to average assets, for example, a key measure of any lender’s core profitability, over the past five years WFC has fallen from the top 20% of large banks to the bottom of Peer Group 1, is defined by the FFIEC and includes the 118 largest depositories in the US. At the end of 2018, the San Francisco-based bank was in the bottom quarter of all banks in net interest income vs average assets as well, whereas in the previous four years WFC was closer to the center of the pack. Likewise interest income as a percentage of earning assets puts WFC in the bottom 20% of the group. Of course, the smallest banks in Peer Group 1 tend to be the best performers, thus the peer average is well-above the average asset returns reported by the top four "zombie" banks. One interesting comparison for WFC and the other top banks is loan pricing. If you look at the top five commercial banks, WFC is doing pretty well in terms of pricing for new loans. Yet the top performer by far is Citigroup followed by JPM. And C has the lowest equity market valuation and highest beta of the top four. What gives? 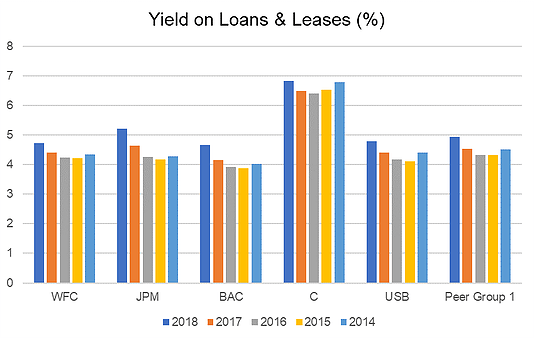 In simple terms, both the yield on loans and leases and the default rate at C are much higher than its large bank peers and, indeed, all of Peer Group 1. Citigroup is in a different business than the other banks, a subprime consumer lending business that is seen by investors as having greater risk financially and in terms of reputation. The bank has lower risk adjusted returns and gets a lower equity market valuation as a consequence. Remember, the only good credit comp for Citigroup is credit card monoline Capital One Financial (COF). Pricing on WFC’s loans was 20bp below peer at the end of 2018, a reflection of the competition among the largest banks for equally large assets. Smaller banks tend to get far better pricing on smaller loans. Of note, in terms of credit performance, WFC has been pretty stable over the past five years including the period of trouble due to the bank’s actions. Like most of the large banks in the US, provisions for future loan and lease losses have been trending lower at WFC as defaults have fallen. Obviously the balance sheet of WFC has been getting smaller, down 3% in 2018. Last year the bank’s capital position also fell to the lowest level since 2014 due to the high (42%) dividend payout vs net income. The Tier 1 leverage ratio of WFC is just barely 9% after a 5.1% decline in 2018, almost three quarters of a point below 2014 levels. This suggests a smaller balance sheet is likely in future quarters. Net loans and leases and non-core funding also declined, an indication that the bank is allowing its loan book to run off compared to the 7.7% loan growth rate reported by all large banks in Q4 2018. One troubling factor to consider for the future is that as WFC allows assets to decline, it is forced to also trim debt, deposits and other sources of funding. WFC is one of the most leveraged large bank holding companies in the US, in the 92nd percentile of its peer group for debt as a percentage of equity capital. 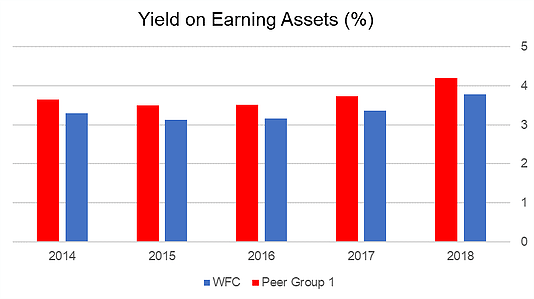 WFC carries long-term debt equal to 65% of the bank’s equity capital vs the peer group average of just 13%. Back in 2014, the same LT debt/equity metric for WFC was in the 40s. To be fair, all of the larger bank holding companies have levered up again since 2008, generally with bloat in the form of derivatives and other non-loan asset types. At the end of the day, WFC is a bank that is essentially coasting along, allowing its assets to run off. Pricing for WFC loans is in the bottom decile of large banks but still quite good compared with the top four banks, admittedly a less challenging hurdle. 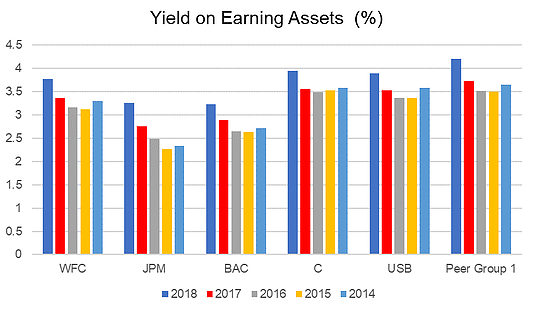 The yield on total earning assets for the bank was just 3.77% at the end of 2018 vs 4.20% for all large banks in the US above $10 billion in total assets. And in terms of all interest bearing funds, WFC’s cost is dead center of the peer group vs the bottom quartile in 2014, when WFC had one of the lowest funding costs of any large bank. WFC is the laggard among the larger banks compared with Peer Group 1, but the asset return performance of JPM is even worse owing to the fact that less than half of JPM’s balance sheet is actually deployed in lending. Like JPM, BAC is likewise not a great performer measured by asset returns. Of note, Citigroup is actually the best performer among the top five commercial banks based on nominal asset returns, this because of its subprime consumer loan portfolio. The pricing of Citi’s non-consumer, commercial loan book is poor, however, dragging down the bank’s overall gross loan yield before funding costs. U.S. Bancorp, however, is the best performer overall based upon risk-adjusted returns and equity market valuation. The chart below shows returns on all earning assets, including loans, securities and deposits with other banks and excess reserves at the Federal Reserve. Under new leadership, WFC could be turned around very quickly in financial terms, but again, we believe that the reputational and regulatory problems are chiefly responsible for the present equity market discount. And we’ll still take USB over any of the top five banks. All that said, WFC offers an opportunity, Avi Salzman writes in Barron’s this week. Ditto. But having to spend several more years in regulatory purgatory is unlikely to help the bank’s financial or equity market performance, again illustrating how shareholders are paying the tab for the grotesque failures of management and the board of directors. Even with all of the regulatory lapses and adverse public attention, WFC in financial terms still is performing better than JPM and BAC. WFC trades at a premium to book value and above the relative equity market valuation of BAC and C. Clearly there are some investors who still find WFC a compelling value, if not now then in anticipation of better times in the future. For us, however, the bank’s performance is average compared to the 118 largest banks in the US banking industry and is likely to stay that way for the next couple of years. And we expect to see a smaller balance sheet at WFC in coming years. Once the legal and regulatory issues are fixed and the signal in terms of earnings performance again is louder than the political and media noise, then we believe that WFC can eventually resume its position at the highest valuation among the top four US banks by assets.